Siddhārtha Gautama was the historical founder of Buddhism. He was born a Kshatriya warrior prince in ancient India which is now located in present-day Lumbini,Nepal. The dates of his birth and death are still a point of controversybut most scholars “suggested that the Buddha died within approximately a few decades on either side of 400 B.C.”. His particular family of Sakya Kshatriyas were of Brahmin lineage (Sanskrit: gotra), as indicated by the family name “Gautama”. 19th-century scholars, such as Eitel, connected it to the Brahmin Rishi Gautama. In many Buddhist texts, Buddha is said to be a descendant of the Brahmin Sage Angirasa. For example, “In the Pāli Mahavagga “Angirasa” (in Pāli Angirasa) occurs as a name of Buddha Gautama who evidently belonged to the Angirasa tribe…”. Scholar Edward J. Thomas too connected Buddha with sages Gautama and Angirasa. After asceticism and meditation, Siddhartha Gautama discovered the Buddhist Middle Way—a path of moderation away from the extremes of self-indulgence and self-mortification. 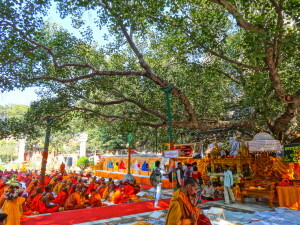 Siddhartha Gautama attained enlightenment sitting under a peepal tree, now known as the Bodhi tree in Bodh Gaya, India. Gautama, from then on, was known as “The Enlightened One ,” the Samyaksambuddha. Buddha found patronage in the ruler of Magadha, emperor Bimbisāra. The emperor accepted Buddhism as his personal faith and allowed the establishment of many Buddhist vihāras. This eventually led to the renaming of the entire region as Bihār. At the Deer Park near Vārāṇasī in northern India, Buddha set in motion Wheel of Dharma by delivering his first sermon to a group of five companions with whom he had previously sought enlightenment. Together with the Buddha they formed the first Saṅgha (a monastic community of ordained Buddhist monks or nuns.) According to the scriptures, later, after an initial reluctance, Buddha also established an order of nuns. Fully ordained Buddhist nuns are called bhikkhunis. Mahapajapati Gotami, the aunt and foster mother of Buddha, was the first bhikkhuni; she was ordained in the sixth century B.C.E. For the remaining years of his life, the Buddha is said to have traveled in the Gangetic Plain of Northeastern India and other regions. Buddha attained parinirvāṇa in the abandoned jungles of Kuśināra. Just before Buddha died, he reportedly told his followers that thereafter the Dharma (doctrine, teaching) would be their leader. The early arhants considered Gautama’s words the primary source of Dharma and Vinaya (rules of discipline and community living), and took great pains to formulate and transmit his teachings accurately. Nonetheless, no ungarnished collection of his sayings has survived. The versions of the canon (accepted scripture) preserved in Pāli, Sanskrit, Chinese, and Tibetan are sectarian variants of a corpus that grew and crystallized during three centuries of oral transmission. The first Buddhist council was held just after Buddha’s Parinirvana, and presided over by Gupta Mahākāśyapa, one of His most senior disciples, at Rājagṛha (today’s Rajgir) during the 5th century under the noble support of king Ajāthaśatru. The objective of the council was to record all of Buddha’s teachings into the doctrinal teachings (sutra) and Abhidhamma and to codify the monastic rules (vinaya). Ānanda, one of the Buddha’s main disciples and his cousin, was called upon to recite the discourses and Abhidhamma of the Buddha, and Upali, another disciple, recited the rules of the vinaya. These became the basis of the Tripiṭaka (Three Baskets), which is preserved only in Pāli. Actual record on the first Buddhist Council did not mention the existence of the Abhidhamma. It existed only after the second Council. The second Buddhist council was held at Vaisali following a dispute that had arisen in the Saṅgha over a relaxation by some monks of various points of discipline. Eventually it was decided to hold a second council at which the original Vinaya texts that had been preserved at the first Council were cited to show that these relaxations went against the recorded teachings of the Buddha. King Aśoka convened the third Buddhist council around 250 BC at Pataliputra (today’s Patna). It was held by the monk Moggaliputtatissa. The objective of the council was to purify the Saṅgha, particularly from non-Buddhist ascetics who had been attracted by the royal patronage. Following the council, Buddhist missionaries were dispatched throughout the known world. History of Buddhism in india. Buddhism is a world religion, which arose in and around the ancient Kingdom of Magadha (now in Bihar, India), and is based on the teachings of Siddhārtha Gautama[note 1] who was deemed a “Buddha” (“Awakened One”). Buddhism spread outside of Magadha starting in the Buddha’s lifetime. The practice of Buddhism as a distinct and organized religion lost influence after the Gupta reign (c.7th century CE), and declined from the land of its origin in around 13th century, but not without leaving a significant impact. Buddhist practice is most common and Buddhism remains a major presence in the Himalayan areas such as Sikkim, Ladakh, Arunachal Pradesh, the Darjeeling hills in West Bengal, and the Lahaul and Spiti areas of upper Himachal Pradesh. Buddhism has been reemerging in India since the past century, due to its adoption by many Indian intellectuals, the migration of Buddhist Tibetan exiles, and the mass conversion of hundreds of thousands of Hindu Dalits. According to the 2001 census, Buddhists make up 0.8% of India’s population, or 7.95 million individuals. Once Buddha was in a dejected mood as he did not succeed in his Yogic practices. He knew not where to go and what to do. A village girl noticed his sorrowful face. She approached him and said to him in a polite manner: Revered sir, may I bring some food for you ? It seems you are very hungry. Gautama looked at her and said, What is your name, my dear sister. The maiden answered, Venerable sir, my name is Sujata. Gautama said, Sujata, I am very hungry. Can you really appease my hunger. The innocent Sujata did not understand Gautama. Gautama was spiritually hungry. He was thirsting to attain supreme peace and Self-realization. He wanted spiritual food. Sujata placed some food before Gautama and entreated him to take it. Gautama smiled and said, Beloved Sujata, I am highly pleased with your kind and benevolent nature. Can this food appease my hunger. Sujata replied, Yes sir, it will appease your hunger. Kindly take it now. Gautama began to eat the food underneath the shadow of a large tree, thenceforth to be called as the great ‘Bo-tree’ or the tree of wisdom. Gautama sat in a meditative mood underneath the tree from early morning to sunset, with a fiery determination and an iron resolve: Let me die. Let my body perish. Let my flesh dry up. I will not get up from this seat till I get full illumination. He plunged himself into deep meditation. At night he entered into Deep Samadhi (superconscious state) underneath that sacred Bo-tree (Pipal tree or ficus religiosa). He was tempted by Mara in a variety of ways, but he stood adamant. While still seated following his Enlightenment, but before his departure for Benares and prior to beginning any teaching, two merchants, called in the texts Tapussa and Bhallika, along with their caravans came across the Buddha under the Bodhi-tree. Both merchants bowed and were deeply moved by his splendor and supreme presence, becoming as it were, the Buddha’s first converts. When the Buddha was walking along the road to Benares following his post-Enlightenment pause he was approached by Upaka, a wandering ascetic. According to the custom of the time the ascetic greeted him and asked who his teacher was or what doctrine he followed. The Buddha told the wanderling that he was the Victor and Conqueror of the World, superior to gods and men, an All-Enlightened One beholden to no teacher. The wandering ascetic could see no hint of anything of the Buddha’s nature and wandered off as wanderlings are oft to do, mumbling under his breath something like, If it were only so! It is said the journey on foot to Benares and the Deer Park from the Bodhi-tree took eight days. There the Buddha met five of his former followers, named in the texts as Kaundinya, Mahanaman, Vaspa, Asvajit, and Bhadrajit. When they first saw Sakyamuni coming toward them from the distance they were initially unaware of the profound change that had taken place and at first thought he was not worthy of their respect. However, as he came nearer their condescending attitude began to wane and shortly thereafter were convinced that he was a teacher worthy of their attention and reverence.